While it may appear otherwise, brick and mortar stores still drive the majority of retail purchases. Retail stores today, however, look and approach the shopping experience very differently from stores of the past. With the emergence of advanced technology, stores are in an age of rapid experimentation and transformation, as they face the increasingly difficult task of luring customers in store. real-life vision of products to help finalize purchasing decisions. As retailers evolve the shopping journey, brands are constantly searching for ways to differentiate their in‑store experience. Here are a few ways brick and mortar stores are redefining the modern shopping experience. Retailers are certainly getting creative. I was very interested in Kohl’s latest endeavor and how they partnered with Amazon to offer free returns. It initially seemed counterintuitive to partner with a competitor, but their strategy is actually driving more traffic and sales for Kohl’s. This creative partnership is keeping Kohl’s relevant today, but the question is—will it still yield success tomorrow? How retailers choose to measure success will directly influence their strategies to achieve that success. Ultimately, choices in measuring success may define winners and losers on the retail battlefield. A survey from Retail Systems Research revealed that retail “winners” expect innovation to drive concrete results (66%) like return on investment but retail “non‑winners” regard the primary metrics of success to be customer satisfaction (60%) or traffic and conversion (53%). Any disconnects between online and in-store shopping experiences severely damage the customer experience. Truly unified commerce experiences are required for retailers to compete effectively today. Omni-channel is no longer a theory, but rather the foundation of the retail experience that ensures consistency across in-store, online, and mobile interactions—including access to inventory, shopping carts, order status and order history. The customer experience must work seamlessly across every point of the customer journey to meet the expectations of today’s consumers. Retailers who continue to be successful under the current market conditions require a solid understanding of their strengths and opportunities. Going forward, the retailers that will prevail are those with the most complete digital transformation strategies, the sharpest focus and the most financial flexibility. To support this transformation, the network infrastructure must be just as flexible as the innovative technology it connects. A recent report from BRP Consulting states: “As retailers move to cloud-based unified commerce, full access to enterprise-wide data in real time will become more common, as it is a necessity to survive.” Retailers must think of their networks as enablers of a unified commerce strategy; providing highly-secure, always-on access to critical applications and data that is critical for success, both now and in the future. While the popularity of e-commerce will continue to grow, the brick and mortar store is not going away. Retailers will continuously evolve to meet the needs of today’s most tech-savvy shoppers, reinventing the shopping experience as they go along. What was different this year? Patient engagement has been a primary focus for many years, but this year’s presentations and education sessions shifted that focus from strategic concepts to tactical and practical solutions that can make a difference today. Organizations are focused on deploying solutions that engage patients where they are with a personalized experience. It was also clear that we cannot forget providers by only focusing on their patients. The focus must be on promoting patient engagement, clinician engagement and—most importantly—engagement between those populations. Patients bring consumer-like expectations into every interaction they have with their healthcare providers and there are rich learnings to be had from other industries. For more insight on this topic, check out the full panel discussion with Healthcare IT Today or watch the recap video of our HIMSS19 session with GoHealth Urgent Care on The Retail Healthcare Delivery Evolution below. Providing critical information to providers at the point of care is essential to improving patient outcomes and reducing clinician burnout. AI and machine learning are key components for making that possible and are starting to yield practical solutions. To extract meaningful and actionable information from an ever‑growing mound of digital data, we need the help of AI and machine learning. Increasing demand for AI and machine learning use cases are forcing organizations to rethink their reliance on traditional data centers and consider transitioning to a hybrid cloud architecture. The sheer volume of data processing required to support AI and machine learning is outpacing organizations’ ability to spin up the supporting infrastructure—accelerating migrations to the cloud. Organizations are just scratching the surface; AI and machine learning will be pivotal topics in conversations to improve both financial and patient health. In 2019, the focus of cybersecurity has shifted to connected medical devices and continued security attacks specifically targeted at healthcare organizations. Consider the worst-case scenario in which a bad actor takes control of a device connected to a patient to literally create a “life or death” event. Cyberattacks are the fastest growing crime globally. Based on PricewaterhouseCoopers research which surveyed over 3,000 business leaders from more than 80 countries, less than half of companies globally are prepared for a cybersecurity attack. According to the insurance organization Beazley, 37% of all ransomware incidents during the third quarter of 2018 were aimed at the healthcare industry. With historically limited budget allocations for cybersecurity in the healthcare industry, I am certainly not alone in my concern that few healthcare organizations are sufficiently prepared for a cybersecurity attack. While much improvement is needed in the healthcare industry with regards to the patient and provider experience and―unquestionably—security, it’s exciting to see an increased focus on the innovative investments and next-generation solutions that will improve the health of organizations in these critical areas. Have you ever been frustrated by your experience as a patient? I found myself recently needing to take my husband to an urgent care on a Sunday due to an unfortunate incident. Everything about the experience from start to finish was less than ideal. The check-in involved a clip board and pen asking questions that we already answered 100 times before. The poor nurse at the front desk then had to manually enter our information into the computer. This archaic process caused delays for every patient waiting, and the room only continued to fill up. What’s even more frustrating, is that it would not take a big investment to improve my experience. A tablet that syncs to the EHR versus a busy nurse trying to interpret my frantic scribbles, would be far more efficient. It can only take one bad experience to deter you from returning and healthcare providers are no exception. After our experience, we would never return to that urgent care. Healthcare is taking the lead from other consumer-oriented industries like retail. Healthcare providers are seeking ways of removing friction from every area of the patient experience, from scheduling to check-in/check-out, pricing, payments, to follow-up care. Even the president of HIMSS points out that every patient wears three hats: citizen, patient and consumer. It is the experience of the patient as a consumer that we can apply the learnings from the retail industry to evolve the overall experience for patients. Especially when looking at ambulatory facilities, whether a physician clinic, an urgent care, or a surgical center, there is an aspect of the guest experience when you are in the waiting room that transitions to the patient experience once you enter the exam room. There is little room for error, patients have choices. Retaining a patient is just as important as acquiring one in the first place. As we know, acquiring a new one is even costlier. Research in the retail industry shows most consumers will choose a competitor after 1-2 poor experiences. Patients today have many options including retail pharmacies offering primary care such as CVS and Walgreens, telehealth providers such as Teledoc and MDLive, and other independent urgent care providers. Are healthcare organizations keeping in mind how little room there is for error with patients? Guest experiences that are convenient to the consumer. Are the locations convenient to where consumers are located? Are charging stations, water and comfortable seating available? Nearly 60% of new and recent healthcare facility construction is in the outpatient space—where there is an emphasis and rush to create smaller, more accessible facilities in locations closer to the consumer. High-performance guest Wi-Fi. Is a secure Wi-Fi service in place? Does it extend into the parking lot? Healthcare providers need to provide high‑performance guest Wi-Fi access for patients waiting in order to keep up with consumer expectations. Pricing transparency. Providing the ability to know a price range for procedures in advance ensures patients are prepared to take on the financial commitments and creates a much-appreciated transparency. Retailers have been doing this for years—price matching with their competitors to keep consumers. Amazon took it to another level where you can even scan the bar code and get your price right in their mobile application. Can patients compare prices easily? Windstream Enterprise learned at the Beckers HIT + Revenue Cycle panel in September that Loyola Health rolled out pricing transparency in their portal and via their mobile application to improve the patient experience. Customized concierge services. Depending on the complexity of care, patients may need concierge and referral services to navigate different healthcare providers in order to get the care they need. Contact Center as a Service can help facilitate the concierge experience. This topic of retail healthcare is one we will be examining much further. Windstream Enterprise will be an exhibitor at HIMSS 2019. Be sure to visit us at booth #735 and attend our speaking session: Retail Healthcare Delivery Evolution on February 14th from 10 -11 AM. Dev Ashish, CIO of GoHealth Urgent Care and Rehan Shah, Regional President of Windstream Enterprise will be speaking much more on this very topic. The entire healthcare industry has become much more focused on improving the patient experience. That’s crucial for a number of reasons, including good old customer satisfaction. It’s easier than ever for patients to explore provider options, and they’re doing so in significant numbers. How significant? According to a recent Accenture study, 7 percent of patients have switched healthcare providers due to a subpar experience. The potential cost to a single hospital: upwards of $100 million. Provider organizations that seek to reverse this trend and improve patient loyalty have a proven means at their disposal. It involves adopting automated tools that other business-to-consumer (B2C) industries have broadly deployed to improve their own customers’ experience, with great success. CCaaS unifies all channels for customer contact (voice, email, and text messages), enabling enterprises to communicate through each customer’s preferred medium, while also tracking all contact with each customer across all channels. UCaaS unites people within the enterprise with seamless communications, tools, and workflows, enabling consistent and fully informed exchanges with the customer, regardless of the individual serving as the point of contact. The aaS (as a Service) designator in CCaaS and UCaaS reflects service deployment in the cloud, which enables higher levels of security and availability at a lower cost than locally hosted solutions. A network infrastructure optimized for the cloud is required to provide the necessary foundation to deliver these technologies. PEaaS wraps these principles of patient engagement, clinical collaboration and security into a single view of the patient as a customer whose loyalty must be secured at every point of contact in their journey. B2C industry leaders have benefited for years from CCaaS/UCaaS-driven improvements to the customer experience and customer retention. With studies repeatedly showing that acquiring a new customer is many times more costly than retaining an existing customer, CCaaS/UCaaS represents a sound technology investment, removing contributors to poor consumer experience that can drive customers elsewhere. PEaaS translates those principles to healthcare, treating the patient as a valued customer with every pre- and post-care interaction. That matters because for patients, searching for a new provider online, including reading patient reviews, takes just minutes. By improving the patient’s ability to communicate with a healthcare provider, and to have information throughout the organization readily available when they do, PEaaS can go a long way in keeping patients from searching elsewhere in the first place. Hard to believe but HIMSS18 is behind us now. It was a terrific show with a lot of talk about how digital transformation is impacting Health Information Technology (HIT) and healthcare in both expected, and unexpected, ways. Our team led a panel discussion Preparing Your HIT Infrastructure for Digital Pathology and Beyond, about network and infrastructure requirements to support the data elements 30–60x larger than digitized radiology images. Including access, analysis, storage, disaster recovery, security and regulatory requirements. Our panel – Dr. Cody Bumgardner and Jan Bates of the University of Kentucky School of Medicine/UK Healthcare, and Tony Thomas, president and CEO of Windstream — did a follow up interview with Colin Hung, editor of Healthcare Scene which put digital pathology, the impact of healthcare transformation overall, and relationship to patient and staff experience, into sharp perspective. Healthcare enterprise networks need to be aligned to where you are going in transforming your healthcare organization. The network cannot be an afterthought and should be a part of the strategic plan for digital transformation initiatives. When network capabilities are not aligned with digitization solutions like digital pathology, it impacts the ability of those initiatives to be most effective. Digitizing pathology reports provides an opportunity to analyze patient data not previously available to make computational sense of in order to positively impact patient care. Previously the technology wasn’t mature enough to digitize pathology data, and network infrastructure wasn’t cost effective to effectively manage data elements of this scale (30-60x larger than digitized radiology images). Once digitized, it can be analyzed with machine learning and artificial intelligence tools to create actionable insights with powerful implications for patient care and experience. Radiology went digital in the 1990s but everything – as illustrated by University of Kentucky Healthcare’s experience – didn’t go digital at once. They tackled digital radiology incrementally, which allowed them to spread the required infrastructure enhancements over multiple years. They plan to tackle digital pathology the same way and target a few initial use cases and plan strategically for the needed infrastructure investments over time. Is your HIT organization ready for digital transformation? Fortunately, network technology is advancing sufficiently to keep up with the demands of digital pathology. 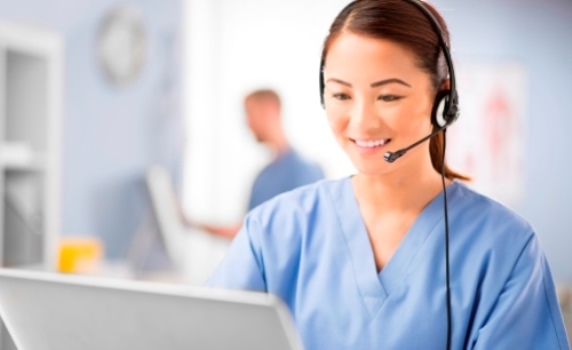 In healthcare IT – as in all other forms of IT supporting dramatically new, innovative, data-intensive initiatives – software-defined WAN solutions, like our own fully-managed SD-WAN Concierge, provide the affordable bandwidth and increased uptime required by digital pathology, and similarly intensive, time sensitive applications. We talked with a variety of HIT leaders at the show about this and would welcome the opportunity to learn about your organization’s goals and discuss ways to help start or accelerate your digital transformation journey. Clinical care is often described as being a blend of art and science. The rapid digitization of health data, led by widespread adoption of electronic health records (EHRs), has created tremendous opportunities for health IT to elevate the science part of the equation. That elevation is especially evident in the rise of clinical decision support systems (CDSS), which support clinical diagnostic processes with analysis of information from beyond the exam room and the bedside. In the process, CDSS has emerged as one of the most concrete ways in which artificial intelligence (AI) is impacting healthcare and health IT. From initial patient exam through discharge, clinicians base their care decisions on a full view of the patient’s condition. In addition to information gathered in exams, care decisions are informed by the patient’s medical history, lab and test results, and evidence-based guidelines for best care practices. In traditional care, accounting for all this information can vary from case to case and from clinician to clinician, and key information can be overlooked or unavailable when needed. When that happens, care outcomes and patient safety can be severely compromised, extending hospital stays, contributing to readmissions, and in some cases causing death. CDSS systems minimize these dangers with real-time diagnostic analysis and timely alerts delivered to clinicians at the point of care. CDSS is by no means a substitute for the skills clinicians acquire through years of education and experience. It is instead a unique opportunity to support clinicians with intelligence that could never have been automated before the digitization of health data. Advanced CDSS continuously monitor the documentation of care in EHR systems while communicating with unrelated information systems, such as those in labs and radiology departments, and ambulatory settings. They are also typically programmed with rules informed by established clinical guidelines. Suggesting a course correction in care based on patient history. One of CDSS’s primary functions is to eliminate drug-drug interactions and track patient allergies. If a physician prescribes what is normally the best medication for a specific condition but is unaware of other medications the patient is taking, or of patient allergies to the drug in question, CDSS can suggest the most effective and safe alternative. This same principle applies to many other factors in patient history. Detecting an unfavorable change in patient condition. Patients are constantly monitored for changes in condition while hospitalized. In many cases, time is of the essence in detecting deterioration. Consider sepsis – the presence of harmful bacteria in tissues, typically through wound infection – which is a leading cause of hospital death. CDSS systems can detect when successive lab tests and changes in patient vital signs indicate the likelihood of sepsis onset, alerting staff to intervene at the earliest possible moment. This principle can guide intervention in a number of types of deterioration. Improving imaging safety. Alerting clinicians that an imaging order may duplicate an existing imaging study for the patient is a basic CDSS function. Advanced CDSS can further eliminate unnecessary imaging by evaluating the need for a study relative to the patient’s overall condition and history, with the potential for recommending a different diagnostic test that avoids exposure to radiation. These are just a few examples of the contribution that AI is making today to care improvements through CDSS. As CDSS become increasingly sophisticated, we can expect them to assume a still greater role in improving care outcomes and patient safety. For CDSS to deliver maximum value, they must serve as effective conduits of data flow between the EHR and multiple health information systems. For maximum positive impact on care, data collection and alert delivery must happen in real-time. To deliver their value throughout a hospital or health system, this process must be sustained for all episodes of care at all times. This represents an entirely new network demand for capacity, often involving extremely data-intensive transmissions such as when relaying imaging. It also represents an entirely new need for 100% network uptime, as a down network can mean an instant return to greater risk to patient safety and care outcomes. Fortunately, networking technology is advancing sufficiently to keep up with these demands. In healthcare IT – as in all other forms of IT supporting dramatically new, data-intensive initiatives – software-defined WAN (SD-WAN) solutions provide the affordable bandwidth and increased uptime CDS requires. As SD-WAN takes hold within healthcare systems, patients and clinicians alike will reap new benefits from the digital transformation sweeping healthcare. In fact, without the appropriate network infrastructure, these exciting HIT technologies can’t live up to their full potential to affect and transform patient care. It seems obvious but always worth a reminder that as more clinical apps move to the cloud, the network becomes increasingly critical to delivering patient care. For example, a major EHR vendor recently had a security breach that made the application inaccessible to their cloud subscribers, impacting those organizations’ ability to access data and keep appointments with patients, and negatively impacting quality of patient care. This highlights not only the need for enhanced cybersecurity for the vendor, but also the increasing dependence on the network/application availability to deliver care. Next up—The Internet of Things (IoT) and the growing myriad of time saving, process automating connected devices that are being welcomed into healthcare organizations everywhere. The key word here is “CONNECTED.” As in, keep in mind what those connected things are connected to. Suffice to say, it’s more critical than ever that healthcare organizations’ enterprise networks are designed and secured to optimize the performance and reliability of those devices if they are to impact their ability to improve patient care. The more devices connected, the greater the need for additional high-quality bandwidth, and/or tools to manage and prioritize access to it. With Healthcare organizations heavily focused on evolving their reimbursement models and how they transition to value-based payments, there is an obvious need for network options that deliver superior ROI. With razor thin margins, healthcare organizations need to find cost efficiencies wherever they can, presenting a bit of a catch-22 with regard to network services. As in, how can we increase bandwidth, availability, performance, resiliency, security, scalability and agility, without increasing costs? If you’re heading for HIMSS18, and healthcare transformation figures anywhere in your strategy, the right network technology – solutions like SD-WAN, wavelength services, access diversity, and UCaaS – delivered by a provider with deep category experience and insight should be on your agenda, too. It’s a simple but essential way to make any other investments you make in innovative healthcare technologies and make it even better. Which takes us back to where we started, about how what WE do helps make every other innovative technology work better. Looking forward to seeing you all at HIMSS. You can find Windstream Enterprise at booth #12222. Or catch our team at Session #85, “Preparing Your HIT Infrastructure for Digital Pathology and Beyond,” Tues, March 6, 4-5 pm, at the Venetian Convention Center, Lando 4301.